We have held the Festival annually ever since 1982. So far, 752 choirs from 36 countries from Europe, Asia, North America, Africa and Australia have participated in the Festival. We hosted choirs from Armenia, Australia, Belgium, Belarus, Bosnia and Herzegovina, Bulgaria, Cyprus, the Czech Republic, Egypt, Estonia, Finland, France, Georgia, Germany Greece, , Hungary, Italy, India, Israel, Serbia , Kazakhstan, Kenya, Korea, Lithuania, Latvia, Macedonia, Moldova, Germany, Poland, Russia, Romania, Slovakia, Switzerland, Sweden, Ukraine, and the United States. The aim of the International Festival of Orthodox Church Music “Hajnówka” is to present the great artistic and spiritual values of Orthodox Church music. Its program also creates opportunities for discussions, meetings, exchanges of experiences and forming new relationships between participants from different environments – thus, it is equally enriched by its aesthetic and educational objectives. So far, the Festival has taken place under the Patronage of the President of Poland as well as the Patronage of the Polish Ministry of Culture and under the Artistic Patronage of prof. K. Penderecki. Among the members of the jury of the previous Festivals, one would find such names as: prof. R. Twardowski, prof. W. Bielecka, M. Erigina, prof. Cz. Freund, prof. K. Górski, prof. R. Grucza, prof. S. Krukowski, prof. E. Kulikowski, rev. dr M. Lenczewski, prof. J. Łukaszewski, prof. B. Sawicka, rev. J. Szurbak, prof. W. Miłkowska, J. Zawisza (Poland), prof. L. Jefimowa, prof. W. Rowdo, O. Janum (Belarus), prof. D. Dymitrow, rev. A. Łaszkow, W. Nikołow (Bulgaria), dr D. Oikonomou, G. Picardo (England), prof. N. Ossorguin (France), J. Dautov (Kazakhstan), A. Brandaws (Latvia), prof. P. Gylis (Lithuania), prof. Z. Zaprow (Macedonia), prof. W. Bołdurat, prof. T. Zgurianu, I.Stepan (Moldova), prof. A. Kożewnikow, prof. W. Minin, rev. Nikifor, prof. I. Rajewski, prof. B. Tewlin, prof. B. Sieliwanow, prof. G. Dmitrak, A. Kiselow (Russia), dr A. Derevjanikowa (Slovakia), P. Vitovec (Switzerland), I.Cyklińskij, prof. Ł. Dyczko, M. Gobdycz, Archbishop Ionafan (Ukraine), , and other experts in choral and orthodox church music. “Saghmos” Choir from Erevan (Armenia), Diocese of the Russian Orthodox Church Abroad Choir from Croydon– Sydney (Australia), from Lahovichi village, the Choir of the Church of the Icon of the Mother of God „Joy of all in sorrow” from Minsk, Minsk Theological Seminary Choir from Zhirovichy (Belarus), “Vila” from Prijedor (Bosnia and Herzegovina), of the Church St. Petka from Plovdiv (Bulgaria), Kykkos Monastery Choir (Cyprus), Coptic from Faisal – Giza (Egypt), of the Church St. Nicholas from Tallin, “Supriadki” from Narva (Estonia), from Oulu, from Tampere (Finland), of the Church St. A. Newsky from Paris (France), of the Church of St. Panteleimon from Tbilisi, “Nekressi” from Lagodekhi (Georgia), Bulgarian Orthodox Church Choir in Berlin (Germany), “Zumoro” Theological Seminary from Kottayam-Kerala (India), Metropolitan from Riga, Old Believer Choir from Daugavpils (Latvia), “St. Zlata Maglenska”, “St. Kliment Ohridski” from Skopje (Macedonia), of the Monastery of St. Teodor from Chisinau (Moldova), Priests of the Orthodox Białystok-Gdańsk Diocese Choir, Children’s, Youth and Mixed Choirs of the Church St. Nicholas and “Carmen” Cathedral Choir from Białystok, Orthodox Institute of Psalmists Choir from Hajnówka, Christian Academy of Theology and of the Church St. Maria Magdalena of the Uspenska Church Choir from Warsaw from Białowieża, Białystok, Fasty, Hajnówka, Narewka, Lublin, Sanok, Wrocław, and Zabłudów (Poland), Orthodox Church Clergy Academy Choir from Sankt Petersburg, The Schools of Orthodox Church Chant of Kruticky Patriarch „Podworja” Choir of Novospassky Monastery from Moscow, Church Choir from Nizhnij Novgorod, Female Choir from Novgorod, Sortowała, of the Church St. Apostle Andrew from Kaliningrad, “Rostov-Don Art Music” of the Church St. George from Rostov and “Lampada” Children’s Choir from Kursk (Russia), of Orthodox Theology Faculty of The University from Iassi (Romania), „Mokranjac”, St. Arch. Gabriel’s Church from Belgrade ( Serbia), Jarabina, of Orthodox Theology Faculty of The University from Presov , „Chrysostomos” Greco-Catholic Cathedral Choir from Bratislava (Slovakia), “Sofia” from Stockholm (Sweden), Choir from Kiev – Pieczerska Ławra, Youth Choir “O czudiesie” Orthodox Church St. Nicholas from Kiev, of Svyatopokrovsky Monastery from Kharkov, from Moshna, Children Cathedral from Winnica, from Zolotonosha, Kiev Orthodox Christian Academy Choir (Ukraine). 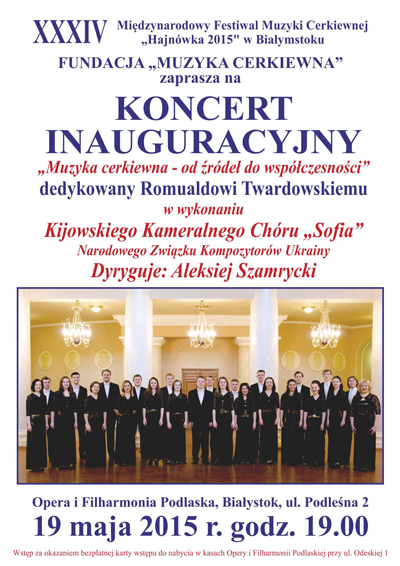 “Dietstwo” from Borysow, “Raduga” from Baranovichi, Railway Cultural Centre from Brest, “Dziannica” from Homel, Trade Union Cultural Centre ,“Ranica”, “Cantus Juventae”, Chamber Choir “Salutaris”,Belarus National University Folk Choral Capella from Minsk “Mozaika” from Mohylew, , Chamber from Novopolatsk, “Cantare” from Orsza (Belarus), „Molitva” from Roosdaal (Belgium), „Dariali” from Tibilisi (Georgia), “Na’ama” form Givat Ada (Israel), “Pro musica” Vilnius University Choir, ”Kamertonas” from Kovno (Lithuania), “Accolada” from Riga, Music Academy from Daugavpils (Latvia), “Rustiko” from Skopje (Macedonia), “Gloria” and “Lira” from Chisinau (Moldova); Medical Academy, Academic of the University, Politechnical Institute, Provincial Police Command from Bialystok, Chamber from Bydgoszcz, Częstochowa Politechnical Institute, Medical Academy, Chamber University from Gdańsk, Politechnical Institute from Gliwice, “Psalmodia” Choir of the Theological Academy from Krakow, Lublin Catholic University Choir, “Bel Canto” from Olsztyn, “Capella Musicae Antique Orientalis” from Poznań, „Slowiki 60” from Szczecin, Zofia Kurowska Cameral Choir from Słupsk, The Inter-University Academic Choit of Warsaw, Politechnical Institute and Warsaw University, “Cansonanza”, “Cantilena”, “Gaudium”, Politechnical Institute Miners’ Choir and Medical Academy Choir from Wrocław (Poland), State University of Omsk Choir, Academic Male Choir (MIFI) and „Soglasije” Cameral Choir of the Moscow National Agricultural University (Russia), “Collegium Musicum” of the State University of Arts from Belgrad (Serbia), “Capella Russian Male Chorus” from New York, “Romeiko” from Philadelphia (USA), “Widrodzennia” Choir from Kriwyj Rih, “Orfeusz” Choir and Lecturers’ Choir from the State Musical Secondary School from Lviv, “Szkolnyje Gody” Choir from Simferopol, Politechnical Institute from Kiev, “Oriana” Choir from Odessa (Ukraine). Children’s Fine Arts School Choirs from Kamieniec, “Lira” Choir from Minsk (Belarus), Choir of Lithuanian Radio and TV from Vilnius (Lithuania), Youth Cultural House Choir from Bialystok (Poland), State Conservatory Choir from Rostov, “Wiesnianka” and „Radost” from Moscow (Russia), “Wohnyk” Palace of Children and Youth Choir, National Music Academy Boys’ Choir from Kiev, “Zorinka” from Ternopol (Ukraine). National Music Acadeny Choir from Astany (Kazachstan)¸ Belarus National Music Academy Students’ Choir, „Elegia” Choir from Minsk, „Visson” Choir of the Republican Center of Contemporary Christian Culture, „Blagowiest” from Minsk, “Sonet” Choir of the Grodno Music Academy, Lida Music College Female Choir (Belarus), “Schola Cantorum Budapestiensis” from Budapest (Hungary), „Renaissance” Choir of the Chisinau Music Academy (Moldova), Student Choir of the St. Petersburg Conservatory, Female Choir of the St. Petersburg National Music College, Gnesinykh Music Academy Choir, Music College Choir of the Moscow Conservatory (Russia), “Collegium Musicum” Choir of the National University of Fine Arts in Belgrade (Serbia), “Soniacznyj strum” Academic Choir from Nikolayev, Worobkiewicz Provincial Fine Arts School Choir from Czerniowce, Academic Choir of the Institute of Fine Arts of the East European National University in Lutsk (Ukraine). “Ter-Oganisjan” Choir and “Avedis” Choir from Yerevan (Armenia), Chamber Choir and „Grodnienskaja Kapella” Choir from Grodno, Philharmonic Choir from Homel, National Radion and TV Choir from Belarus, R. Shirma National Choir, Music Academy Choir, Archstrategist Michael Orthodox Brotherhood Choir, “Radziwiły” Choir and “Cantemus” Choir from Minsk (Belarus), “Ivan Spasov” Choir and “Filopopolis” Choir from Plovdiv, “Alleluia” Choir and “Joan Kukuzel-Angeloglasniat” Choir from Sofia (Bulgaria), Estonian Male National Choir from Tallinn (Estonia), “Kiedrova” Choir from Paris (France), “Orovela” from Tibilisi (Georgia), „Drama’s Domestics” Byzantine Choir from Drama, (Greece) “Musica Aeterna” from Jerusalem (Israel), “St. Ephraim” Byzantine Choir from Budapest (Hungary), “Eufone” from Turin (Italy), National Theatre of Opera and Ballet Choir from Astana (Kazakhstan), “Orthodox Church Music” Choir from Riga (Latvia), “Aukuras” from Klajpeda, “Brevis”, “Vilnius” and “Orthodox Music Ensemble” choirs from Vilnius (Lithuania), Music Academy Theatre and Fine Arts Choir, Moldova Republic National Philharmonic Choir, “Credo” Choir of the Orthodox Metropolis, „Moldova” Choir of National Radio and TV, “Gavriil Musicescu” from Chisinau, National Transnistrian Choir from Tiraspol (Moldova), Polish Radio and TV Broadcast Choir from Kraków,, “ Warsaw Chamber Opera Orthodox Church Music Cameral Ensemble”, Szurbak Male Choir of Church Music, „Modo Maiorum” from Warsaw, Wrocław Philharmonic Choir (Poland), Chamber Choir from Kaluga, Chamber Choir of the Moscow National Conservatory, Svieshnikov National Choir, “Kozevnikov” Moscow National Choir, Jurlov National Capella Choir and „Vivat” Choir from Moscow, “Drevnierusski raspew” from Moscow, “Niżnij Novgorod” Choir, Ural National Chamber Choir from Perm, “Svietilen” Choir from Starocherkask Monastery from Rostov, M. Glinka National Capella from St Petersburg, “Saratov Theatre of Choral Music” from Saratov, Cameral Choir from Tambow, Tomsk National University Choral Capella, North Ossetia’s Philharmonic Male Choir from Vladikavkaz, National Kostroma Philharmonic Academic Chamber Choir (Russia), “Corala Patriarhiei Romane” Choir, “Preludiu” Choir of the National Center of Arts and „Divina Armonie” Choir from Bucharest (Romania), Dnitropietrowsk Philharmonic Choir, “Legenda” Choir from Drohobych, „Kiev” ,“Credo”, “Krieshtchatik”, Rewucky Men’s Choral Capella and “Sophia” Choir of the National Composer Association from Kiev, “Oranta” from Lutsk, “Oreya” from Zhitomir, “Tawriczeskij Błagowiest” from Symferopol, “Woskriesinnia” from Ivano-Frankivsk, D. Bortnansky Academic Choir from Chernihiv (Ukraine). 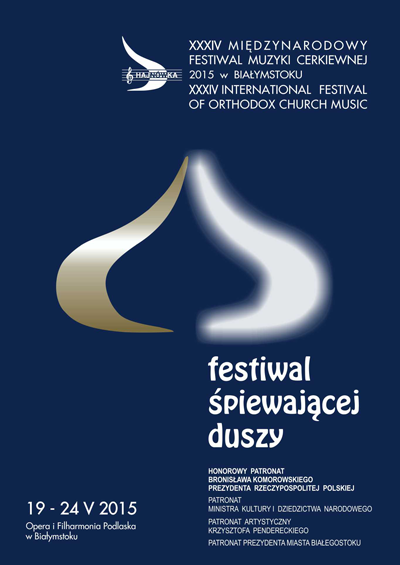 We have organized the International Festival of Orthodox Church Music „Hajnówka” in May of every year since 1982. The category and the authenticity of each amateur choir should be confirmed by its artistic manager. The repertoire should contain no less than five Orthodox Church music pieces, while the time to perform them should take around 18-20 minutes. The organizers recommend selecting a repertoire from various historical periods. Any changes in the repertoire should be reported by 15 March 2015. Applications should be sent to the Organizers’ Office by 15 December 2014. The organizers will inform the choirs about whether they qualified for the Festival by the end of January 2015. Qualified choirs, invited to participate in the Festival, are requested to submit the following data before the end of February 2015.
c) one copy of musical notation for each of the compositions in the program. All participating choirs will be granted commemorative diplomas. The best choirs will be awarded prizes. The choirs appointed by the jury are obliged to take part in Gala Concert in the same composition as during the qualifying auditions..
Organizers cover the lodging and sustenance (3 meals a day) for choirs. Qualified participants must cover their travel expenses and are to partly finance their visit by transferring funds (18 EURO per person per day) to the organizers’ bank account before 15 February 2015. Submitting a written resignation from participation in the Festival by 1 March 2015 allows the possibility of refunding the transferred funds. During the Festival, the choirs will have an opportunity to perform in additional concerts (with different repertoire). The organizers reserve unlimited rights to the recording, duplication and distribution of the recorded concerts. The choirs and their conductors will not receive any payment for participation in the concerts, or for eventual radio or TV broadcasts of recordings made during the Festival. All regulations are final and binding.